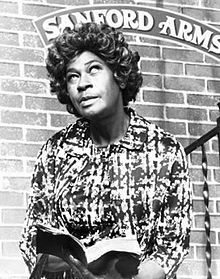 LaWanda Page (born Alberta Peal; October 19, 1920 – September 14, 2002), was an American actress and comedian best known for her role as Esther "Aunt Esther" Anderson in the popular television sitcom Sanford and Son which originally aired from 1972 until 1977. Page later reprised this role in the short-lived television shows Sanford Arms (1976–1977) and Sanford (1980–1981). Page was born Alberta Peal on October 19, 1920, in Cleveland, Ohio and raised in St. Louis, Missouri. Page attended Banneker Elementary School. Page began her show business career dancing at age 15. Page later worked in small nightclubs billed as "The Bronze Goddess of Fire," an act which included Page eating fire and lighting cigarettes with her fingertips. After paying dues on the club circuit, where she shared stages with noted comedians such as Redd Foxx and Richard Pryor, Page moved to Los Angeles, California in the early 1960s where she became a member of the comedy group Skillet, Leroy & Co. Skillet was Ernest "Skillet" Mayhand (1916–2007) and Leroy was Wilbert LeRoy Daniel (1928–1993). In Los Angeles, Page started honing the feisty approach to comedy that would make her famous. LaWanda Page and Redd Foxx (who portrayed Fred Sanford) were very close friends from the time they were pre-teens, having attended school and grown up together in St. Louis. Eventually, both entered the field of comedy separately and performed their own stage acts. During her tenure as a stand-up comic, a career she continued into the 1990s, Page often was billed as "The Queen of Comedy" or "The Black Queen of Comedy". Page recorded several live comedy albums for the Laff Records label in the late 1960s and early 1970s under her LaWanda Page stage name. Other than the relatively clean Sane Advice album, released two years after the run of Sanford and Son, Page's albums and stand-up material were raunchy blue comedy in nature. She was one of the few women who performed extended spoken word pieces in the black signifying or toasting tradition. One release, a gold-selling album called Watch It, Sucker!, was titled after one of her Aunt Esther character's catchphrases in order to capitalize on her newfound television fame. On Sanford and Son, Esther Anderson ("Aunt Esther") was the sister of Fred Sanford's late wife Elizabeth. Page had been performing her comedy routine in nightclubs in St. Louis and then Los Angeles for several years, but had planned to leave show business to move back to St. Louis to take care of her ailing mother. When Redd Foxx was offered a sitcom in Los Angeles, he brought his childhood friend Page to the attention to one of the show's producers, who was already familiar with Page and her act. Foxx subsequently asked Page to read for the role of Aunt Esther. She was offered the role after she auditioned. However, prior to taping, producers became concerned when Page, whose experience was limited primarily to nightclub stages, seemed to have difficulty working in a sitcom format. Eventually, one of Sanford and Son's producers told Foxx that Page would need to be fired and that another actor would need to be cast before the show could begin taping. Foxx responded by insisting that Page keep the part, even threatening to walk away from the show if Page were fired. The producers relented, and Page's Aunt Esther went on to become one of the most popular TV sitcom characters of the 1970s. Page's Aunt Esther was a combination of devout churchgoer and tough-as-nails realist, unafraid to state whatever was on her mind. While her relationship with Foxx's character Fred G. Sanford was usually confrontational, she portrayed a tender side when it came to her nephew Lamont. Common issues between brother-in-law and sister-in-law were Sanford's lack of business success and lukewarm religious faith. Sometimes, primarily because of their shared love for Lamont and the late Elizabeth, the two adversaries managed to find common ground. Although Sanford and Son was clearly Foxx's vehicle, Page's Aunt Esther could hold her own against the show's star. The church-going act of Esther was a great contrast to the raunchy, expletive-filled material of Page's live act and records. In 1977, Page appeared in an episode of The Love Boat entitled "A Tasteful Affair; Oh, Dale! ; The Main Event" alongside Sherman Hemsley. Page also appeared on several episodes of The Dean Martin Celebrity Roasts, and over the next two decades occasionally guest-starred in episodes of other popular television shows, including Amen, Martin, 227, Family Matters, and Diff'rent Strokes. She appeared on Circus Of The Stars as a fire eater. In the early 1990s she appeared on several tracks of the debut album by RuPaul entitled Supermodel of the World, most notably the hit song "Supermodel (You Better Work)." She also appeared in several music videos from the album. Shortly before her death she appeared in a series of comical Church's Chicken television commercials featuring the catchphrase "Gotta love it!" Among her movie credits are appearances in Zapped! (1982), Good-bye, Cruel World (1983), Mausoleum (1983), the Steve Martin film My Blue Heaven (1990), as an extremely foul-mouthed clown in Bobcat Goldthwait's 1991 comedy Shakes the Clown, CB4 (1993), a cameo appearance in the 1995 movie Friday, stealing the opening scene with a one-liner, Don't Be a Menace to South Central While Drinking Your Juice in the Hood (1996), and a recurring role as Ms. Porter during the first season of the 1990s television sitcom Martin. Page was married three times, the first being at the age of 14. Page was the older sister of actress Lynn Hamilton. Page died of complications from diabetes on September 14, 2002, at age 81. She is interred in an outdoor crypt at Inglewood Park Cemetery in Inglewood, California. Page's daughter, the evangelist Clara Estella Roberta Johnson, died on June 4, 2006, in Los Angeles, California, at the age of 69. ^ a b c "Black and Blue: The Redd Foxx Story". books.google.com. ^ a b c d "Black Comedians on Black Comedy: How African-Americans Taught Us to Laugh - LaWanda Page". books.google.com. ^ a b c "Comediennes: Laugh Be a Lady - LaWanda Page". books.google.com. ^ a b "Obituaries in the Performing Arts, 2002: Film, Television, Radio, Theatre - LaWanda Page". books.google.com. ^ a b c d "JET Magazine - LaWanda Page, 81, Of 'Sanford And Son' Fame Succumbs In Los Angeles - October 7, 2002". books.google.com. ^ a b c Watkins, Mel (September 18, 2002). "LaWanda Page, 81, the Aunt On TV's 'Sanford and Son'". The New York Times. Retrieved November 5, 2017. ^ TV Guide, March 17–23, 1973. ^ Scott, Vernon (24 May 1976). "LaWanda Page lives in Beverly Watts". Ontario Daily Report. Retrieved 16 November 2017. This page was last edited on 25 February 2019, at 18:56 (UTC).